What fish do you think this is? Would you believe if I say this is an anchovy? There is one seafood shop in my neighborhood where I go to buy fresh seafood. I found a fish which looked quite similar to mackerel. I asked the name and”Anchoa” was the answer I got. Since my memory in Spanish is quite limited, I had to ask him to write the name on the package so that I don’t forget. I came home and looked for the name in English. To my surprise, Anchoa is a Spanish word for the anchovy. I have seen fresh anchovies many times in my life since I am from a town where the anchovy production ranks the #1 in Korea. I literally grow up eating fresh anchovies in my childhood but I have seen nothing like this big. 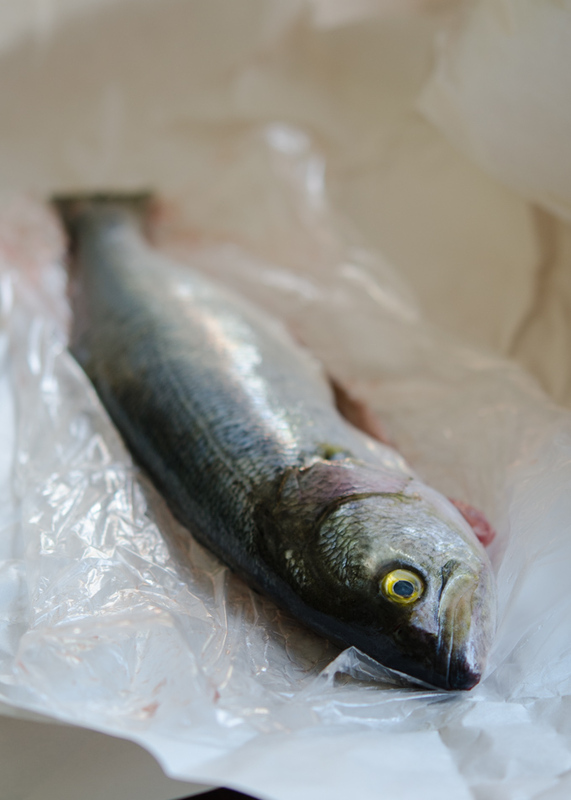 I learned that some large anchovies can measure up to 40 cm (15 inch). This guy was measured about 13 inch. I would never know that he would be a cousin to my usual 3-inch anchovies by looking at his appearance. After some thought on how I want to cook this stall dude, I decided to grill him. I sprinkled some salt on top to get the crisp skin. 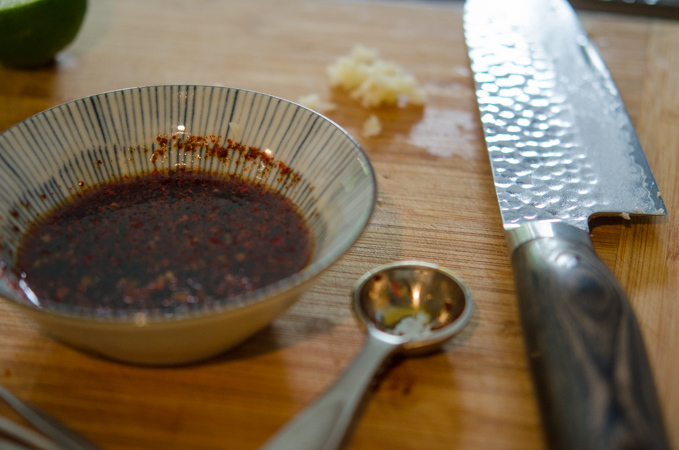 For the sauce to go with, I mixed soy sauce with a little bit of lime juice, garlic, and Korean chili flakes. … drizzled the sauce over, and ate. I served with rice. Yes! It was delicious! The meat was firm and hold itself very well during the grilling. All my life I have eaten anchovies in many different form, from a raw salad to a soup. I never had a grilled anchovy until now, and my love for anchovy is continuously going strong. Go anchovy! 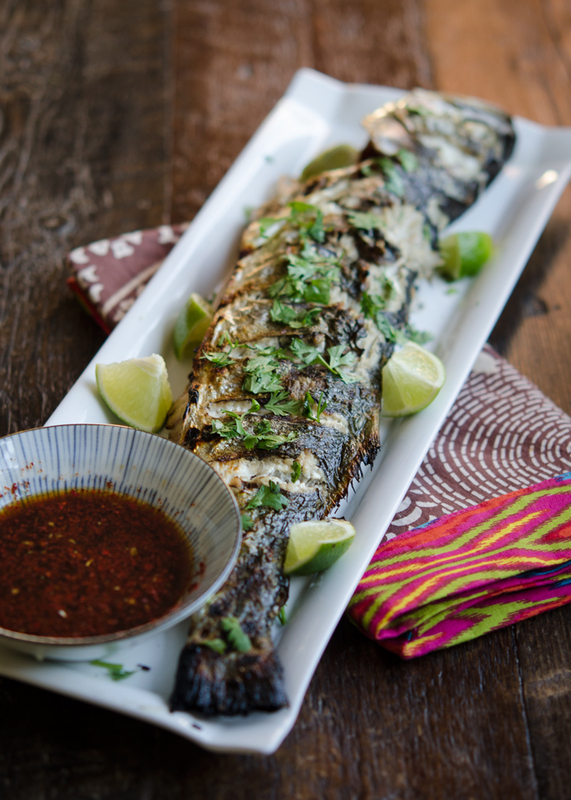 By the way, the soy lime chili sauce is good with any grilled fish if you want to try it. 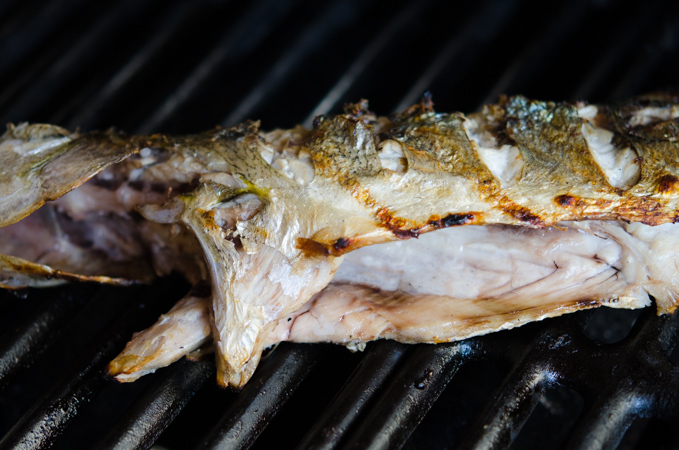 Any firm textured fish, such as mackerel, grouper, croaker, or snapper, would work great with grilling. Heat the grill until very hot. Give a few slits to the fish and brush with oil. Sprinkle a few pinches salt on top. 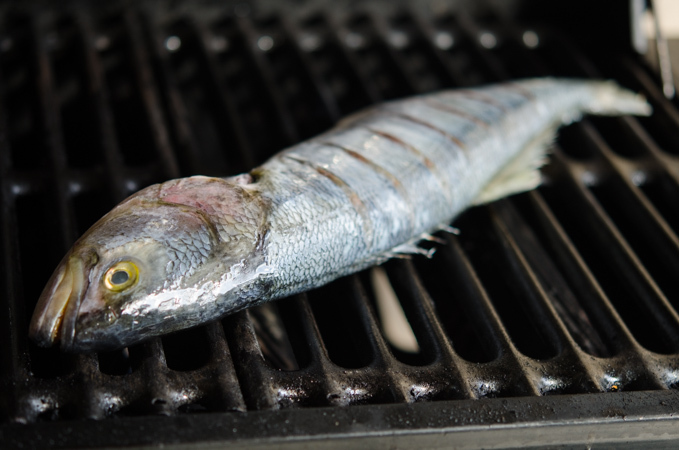 Place the fish on a hot grill and cook until done. Turn your fish to the other side carefully and finish grilling. Meanwhile, mix Korean soy sauce for soup, lime juice (or lemon juice), garlic, chili flakes, and water in a small bowl. 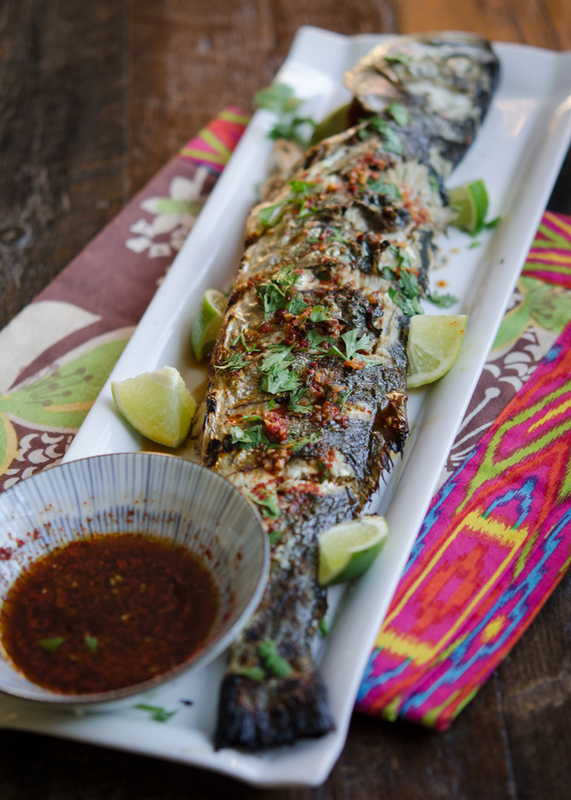 Sprinkle cilantro over the grilled fish, and spoon half the amount of sauce on top. You can dip the fish with the sauce as you eat, if needed. Serve hot with rice. Hi Holly! I had no idea you were still blogging! I don't know why but I haven't received your email newsletter. I checked my spam but it's not there. And when I try to subscribe, it says my email (this email that I use to leave a comment) is already listed. :( Do you know if you can remove my email so that I can re-subscribe? Is it only me who has this issue? 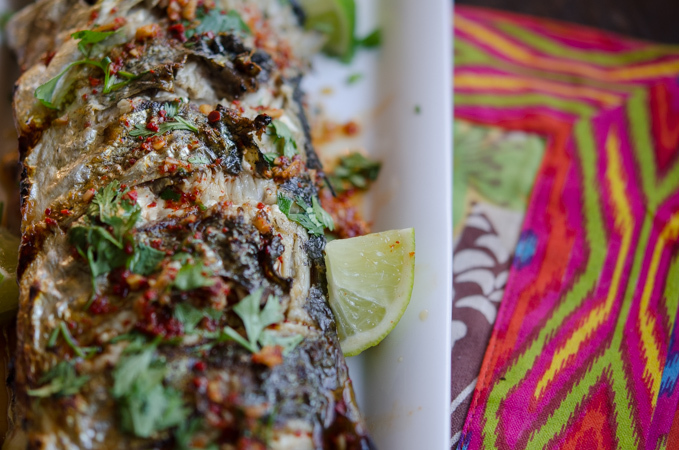 I love your soy lime chili sauce and I will DEFINITELY try this recipe (with available fish). Looks so good!!! Hi Nami, Yes, I am still blogging. I need to post more often but still hanging in there. That's weird that you don't receive my new post. It happens to me, too, with other blog that I am subscribing as well. I just unsubscribed your email address from my list. Please sign up again and let me know if it works. Thanks! Hope you are doing well. Anchovy? Really? I didn't know they came that big!! This i my kind of food. I grew up eating whole cooked fish and it's still my favourite way to cook it. I even scale and clean them myself! Though I am a bit gun shy at the moment after I ripped off half a thumbnail on a snapper fin (so painful!!) I love the simple sauce you use in this. It's all you need with fish. I never make complicated dishes - if you have a good piece of fish, keep it simple!! I totally agree wit you on simplicity on fish dishes. Nothing fancy, a good fish with a simple sauce is all you need. Hi Holly, this is just an awesome recipe. And your pictures just made me hungry :) Thanks for sharing. Holly, this grilled fish looks amazing!!! my dad would be all over this!!! I would love this with mackerel! beautiful! Hi, I love your blog... here in Malaysia, we eat the same grilled fish and the same sauce, but instead of red pepper flake, we used small thai's chilies pepper and diced onion. with dark soy sauce and lime juice or sometime with lemon juice or calamansi juice or plain white vinegar. we love it dark and rich so the sauce were not diluted with water... anyway its good. thanks for sharing your recipes... take care.. Yes, I remember eating several fish dishes in Malaysia. I used to live there. I miss all the great Malaysian food, yum! Thanks for your comment.